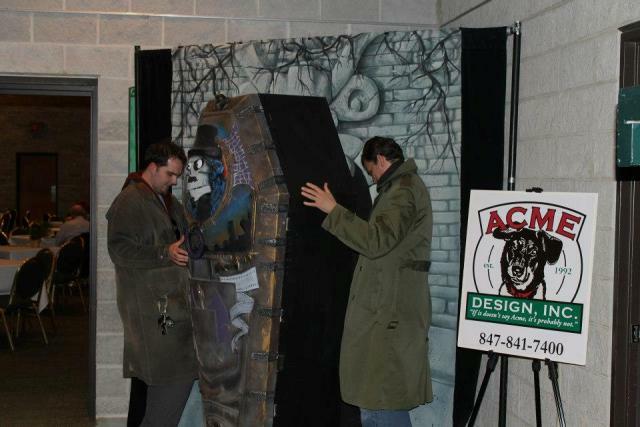 Svengoolie’s New Coffin Knocks Fans Dead! I was attending a Brookfield Chapter AAZK (American Association of Zoo Keepers) meeting at Chicago’s Brookfield Zoo late last year when the subject of our annual Vital Grounds spaghetti dinner/fundraiser came up. As they’ve been doing this event for several years now, they’ve pretty much got it all down to a science (food, auction items, ticket info, etc). With regard to Rich Koz’s cardiac event, I admit to ingesting a heavy dose of denial. After the initial shock wore off, I told myself he’d have some state of the art medical procedure that would basically make him the horror host equivalent of the Six Million Dollar Man; Better…Stronger…Faster! “He’ll be back in the studio in no time!” I thought, while imagining him booking all kinds of great new summer appearances such as bungee jumping off The Willis Tower. Unfortunately, that’s not how these things work. “It’s going to be too soon for Svengoolie,” I said. …until just over a week later when just thinking about it would cause my stomach to do somersaults. I’d videotaped the occasion at The Nightmare on Chicago Street and it wasn’t until recently that I had the motivation to even look at that footage let alone turn it into a YouTube clip (below). 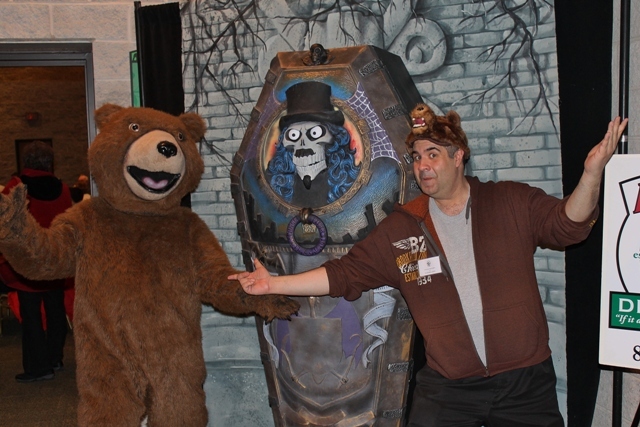 Obviously bringing the coffin (which, in lieu of the situation, people close to Sven decided to start referring to as “The Box”) to the zoo wasn’t up to me so I got permission from both Acme Design as well as the Svengoolie camp before giving them a thumbs up. To our delight, both parties agreed and now fans would have a chance to see some Chicago TV history right here at Brookfield Zoo. The event started at 4pm and the Acme folks (Clint Borucki, Ryan Guenther, and Elizabeth Haney) showed up soon afterwards with their new creation. 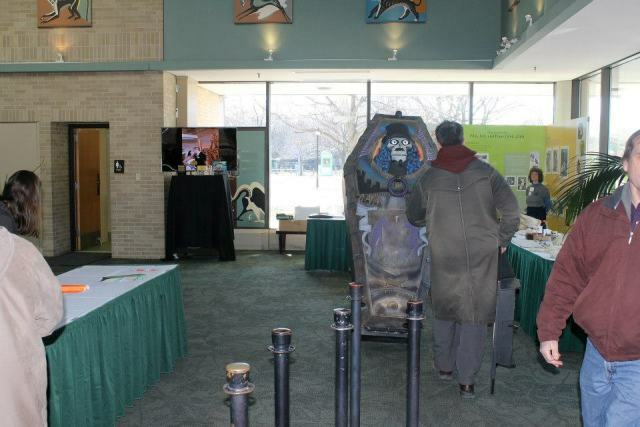 Taking place at the zoo’s Discovery Center, the coffin was strategically placed between ticket sales and the main dining area. 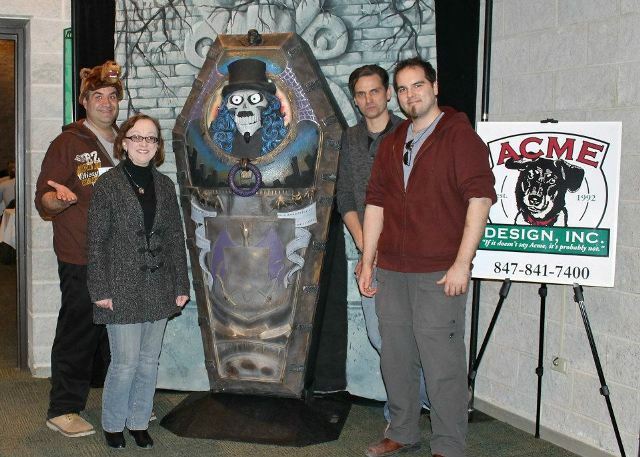 With Elizabeth Haney, Clint Borucki, & Ryan Guenter from Acme Design! Though surrounded by my fellow zoo volunteers, I chose to attend this event as an AAZK member only, thus having the freedom to stay by the coffin the entire night while answering fan questions. This allowed the Acme crew (who had just returned from a business trip before graciously volunteering their time for us) to relax and enjoy the food/spirits while also presenting me with a rather unique zoo experience. My main responsibility as a docent is to be stationed near exhibits and interpret (talk about the animals) with guests. 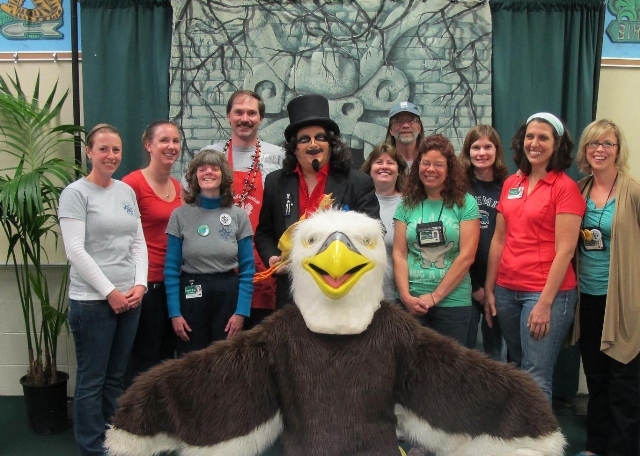 This marked the first time I was able to perform those same duties at the zoo for something Svengoolie related instead. Man, I love it when my two worlds come together like that! 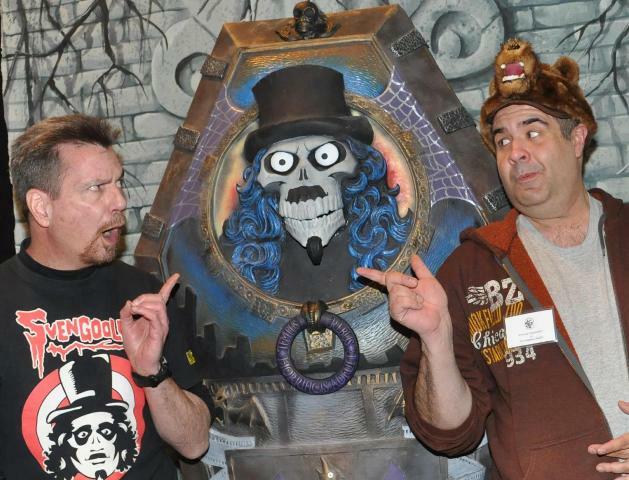 I was able to talk to a lot of guests regarding the history of the show, the old coffin, and some of the neat touches featured in the new design including nods to the first horror host, Vampira, the original Jerry G. Bishop Svengoolie, the Chicago skyline, and much more! One fan who was particularly enamored by it was Mariann Blacconiere. Marianne is a social worker at the Hines VA and also a HUGE Svengoolie fan which she’d later prove by putting her money where her mouth is. This event was in support of Vital Grounds; an organization that obtains land for grizzlies. What they do is purchase property that goes up for sale in bear country and revert it back to its natural state. This not only creates more territory for bears but other wildlife as well; providing them more freedom to roam , limiting human contact, while also promoting better genetic diversity. 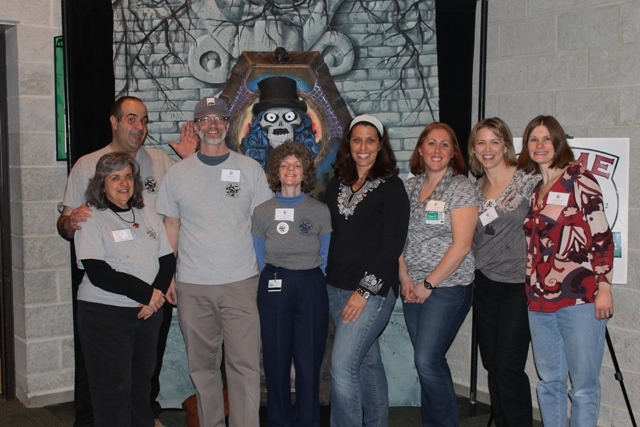 It’s a great organization and I’m really proud of Brookfield Zoo, our AAZK Chapter, and our Zoo’s Director (Dr. Stuart Strahl who recently became a Chair on their Board of Trustees) for supporting them. 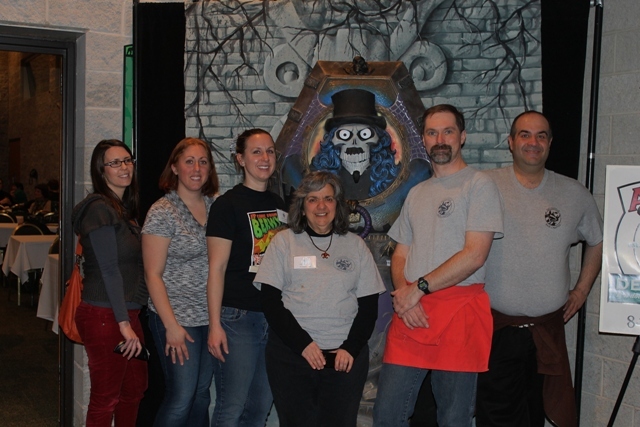 The spaghetti dinner also featured an auction which primarily offered animal or Brookfield Zoo related items. There were, however, a few Sven-goodies included as well! Scary Monsters Magazine publisher, Dennis Druktenis, kindly donated some copies of the new Svengoolie Tribute issue (ones with the rarer, variant cover) which he shipped to Sven who made them even more valuable by adding his signature to. 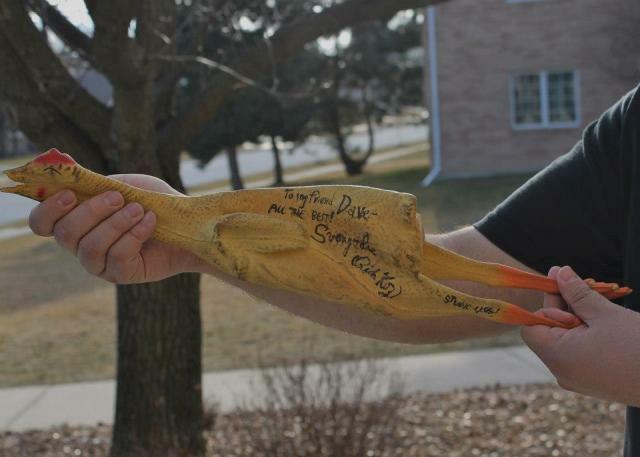 He also donated a signed, studio-used rubber chicken! I have one of those myself, thanks to winning one of Sven’s drawings via his monthly newsletter (sign up at his site HERE and get your FREE chance!). 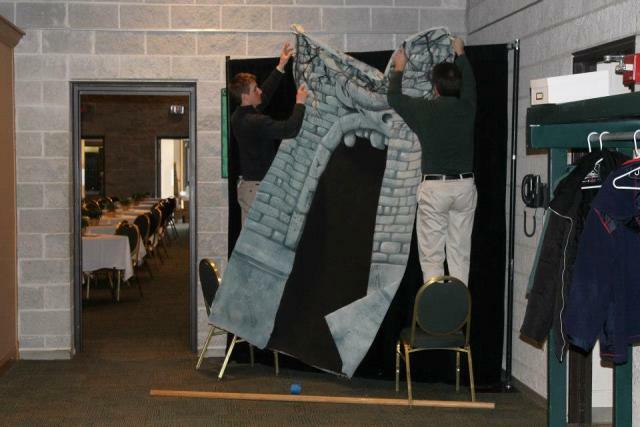 The items arrived courtesy of Sven’s assistant, Jim Roche, who stayed the remainder of the event. Jim is always a pleasure to hang out with as he’s a quick wit with boundless energy. With the incomparable Jim Roche! As soon as the Svengoolie items hit the auction table, Mariann started bidding on them while keeping vigil nearby to see if anybody else showed interest. Fellow Sven-Goolie, Angela Urban, rose to the challenge and the two women began a bidding war. Though Angela put up a brave fight, in the end she’d prove no match for Mariann who not only walked away with BOTH of those items but some old Brookfield Zoo stuff as well. This included animal signage for a turkey vulture. It must have been an old sign because I can’t recall any time in the last 14 years I’ve been affiliated with the place that we’ve had one of those. Mariann would later hand the sign over to Jim as a “Get Well” gift to Svengoolie – though I think it would have been more appropriate had it been heralding a chicken-hawk. 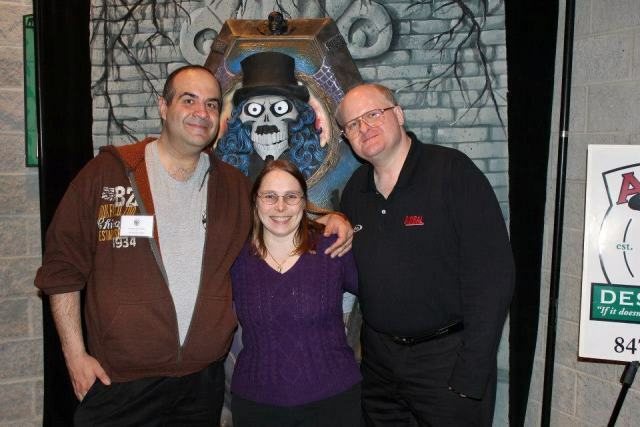 Mariann Blacconiere – One SERIOUS Svengoolie fan! 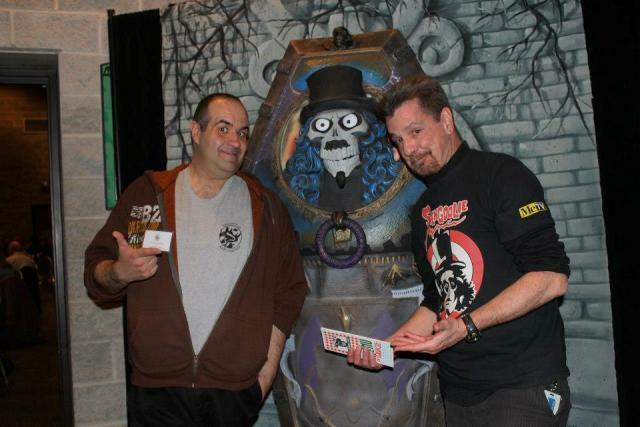 So the big question is, was the coffin as big a draw for this event as Svengoolie had been himself in past years? Let me answer that with one of his own show sound FX: Uh, no…sorry about that, sorry, sorry. Oh well, the turn out was still decent, the food was good, and we all had a great time anyway. The auction was also an overall success with one item going for over $1,000! I zoomed home after it was over to get some needed rest. It was the very next morning that I had to leave for Horrorhound Weekend in Cincinnati (and by now you know all about THAT event). While Svengoolie is still probably not planning any bungee jumping excursions, he IS back on his feet and now ready to greet his public once more! Yes, just over a month after the spaghetti dinner, my childhood idol would be visiting a place where he’d fit right in amongst other super heroes. ..C2E2! Coming up…The Return of Svengoolie! 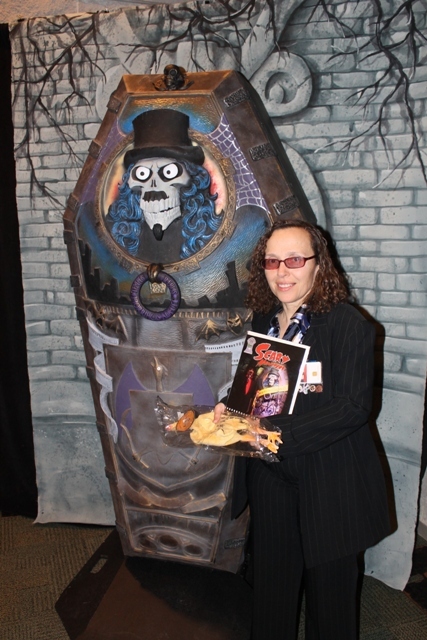 This entry was posted in Horror Hosts, Masks, Models, & Props!, Stalking Svengoolie! and tagged AAZK, Bears, BROOKFIELD ZOO, Chicago Horror, Svengoolie, Vital Grounds, Wildlife. Bookmark the permalink. ← Monster Madhouse Strikes Back! Get well soon! That “box” rocks!